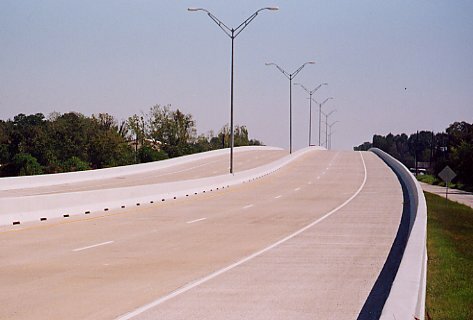 The Hardy Toll Road was authorized by Houston voters in 1983 and completed in 1988. It has not met its traffic projections and is not generating enough revenue to meet its bond payments, but this is not a problem because the Sam Houston Tollway is a cash cow, generating more than enough revenue to cover the Hardy shortfall. The reason for the shortfall is because the Hardy Tollway runs parallel to I-45, which is free, so the Hardy Toll road only sees significant traffic during rush hour. The Hardy Toll road has been a boon to the Woodlands, providing a high-speed route to downtown Houston and ensuring the Woodland's perennial status as #1 in new home starts in Houston. The road is also a pleasure to drive, since much of it is flat and straight, and nearly all the route is free of commericalism. Since around 1990, there have been plans to extend the Hardy Toll Road into downtown Houston. It's finally going to happen, and better yet, it's going to be a freeway! In October 2000, the Harris County Commissioners Court voted to approve a schematic of the new facility. According to sources at the Harris County Toll Road authority, construction on the downtown connector will begin mid to late 2002, and be complete by late 2004 or early 2005. 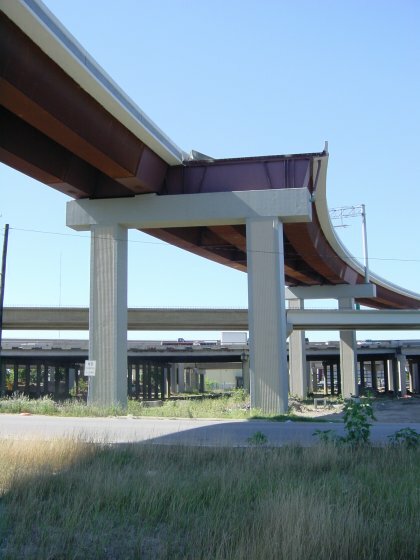 The connector will use ramps that are already under contruction at the US59/I-10 interchange, and then proceed along railroad right-of-way to the existing toll road terminus at I-610. The new freeway will have 4 lanes. See the photo below of the stub-out where the new freeway will connect to the new interchange at US 59 and IH-10. Lanes 6 lanes from I-610 to airport connector; 4 lanes northward. This stub-out in the new connection ramp at the interchange at US 59 and IH-10 downtown will connect to a new ramp to the Hardy Toll Road freeway extension into downtown. Photo taken 22-May-2001. The connectors at I-610. New structures for the tollway main lanes will be added with the downtown connector, with construction beginning in mid 2001. This view looks east with the I-610 westbound lanes in the foreground. A typical view of the Hardy Toll Road, looking north. The tollway is continuously at grade between I-610 and BW8, with all interecting roads passing overhead. This is highly unusual for Houston.The railroad runs down the center, and a high-volage right-of-way is along the west side of the corridor for much of the length. Between I-610 and Beltway 8, several interchanges have this configuration. Photo looks north. Here the southbound lanes cross over the railroad tracks just south of BW8. Railroad crossings are much more frequent north of BW8. View looks north. This is the interchange where the Hardy Toll Road and airport connector meet, featuring 4 direct connectors. The interchange was completed in January 2000. View looks north. This is the new airport connector. It has been deserted every time I've been there, but maybe it's more crowded during the week. View looks east.